Don’t let anyone tell you it is easy to create a successfully engaging Facebook Fan Page. It is not. It’s not an insurmountable task either. But it requires planning, time, some kind of HTML knowledge, design skill, and imagination. Originality doesn’t hurt either. There are great tools and tips available that will help you create an outstanding page for your brand without an immense amount of time or capital invested. 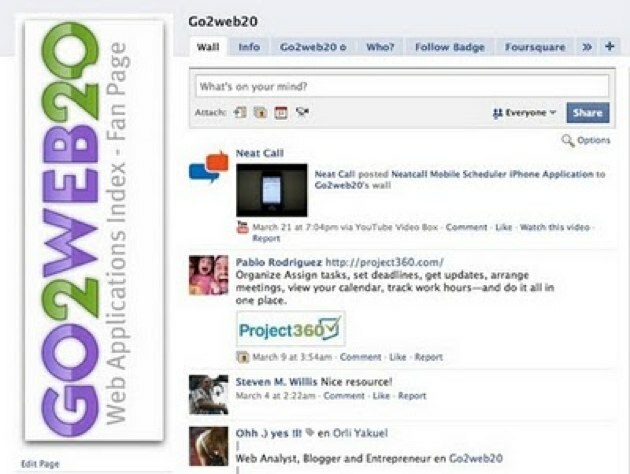 I’ve been working to improve our own Go2web20 fan page and I have some tips from my experience that I’m more than happy to share. Let me start off by saying, Facebook itself is the only true obstacle in the whole page creation process. If they accepted all code formats, it would be much easier to create any page. It would open up the space to immeasurable possibilities and we would see a wider variety of amazing, unique pages. But unfortunately, this isn’t the case so you have to find ways to work with what you’ve got and then take it up from there. 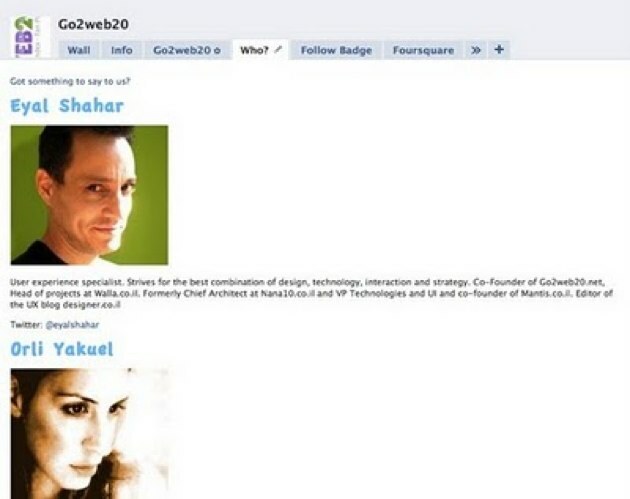 You might not know this but you can use a picture for your profile page as large as 200 x 600 pixels. The good thing about this is a larger picture offers better visibility of the campaign itself, which may include your company logo or a promotional banner of any kind. The downside to this eye-catching stunner is that it shifts the focus away from the rest of the page. This is why you need to plan your page first. Decide where you want the eyes of your visitors to go: on your image or on the rest of the page’s elements. You can play and preview your ideas, change them back and forth, and see what’s ultimately best for goals, your page, and its users. Facebook allows you to change the traditional boring tabs to be more exciting, original, and relevant. If you want to change your page’s tabs, you will first need to add this FBML application to your page. Then, go to your page manager, find the FBML tab, and click ‘edit’. 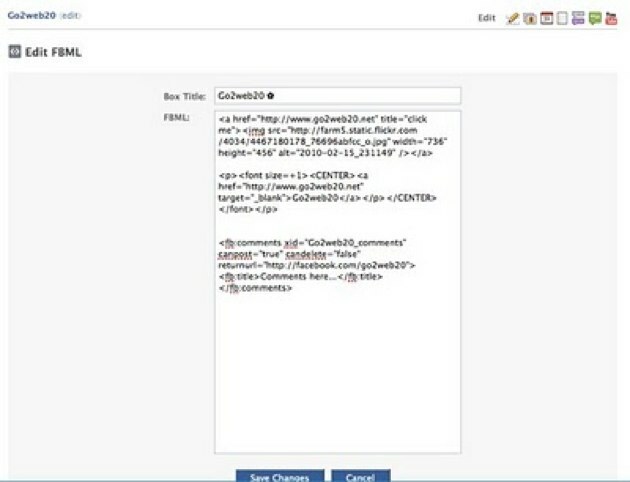 Within the box that opens, you will be able to change the tab name, and add HTML code. What I’d suggest that you do is to first create a main landing tab that will welcome visitors to your page. I linked to my Website on this page since this is a big part of a fan page concept – to offer Facebook users access to my site in a new way. Finally, I added the Facebook comments box to enable people to leave comments in regards our website. The fb comment code can be found at this wiki page in the examples section (thanks for the tip @eyalshahar). Again, all I did was to customize it slightly with the relevant information of our site. In my opinion a huge value add in terms of engaging my users and inviting conversations to happen here. Now, since this is the tab you want new visitors to see and experience first, you need to set it this way on your admin page. 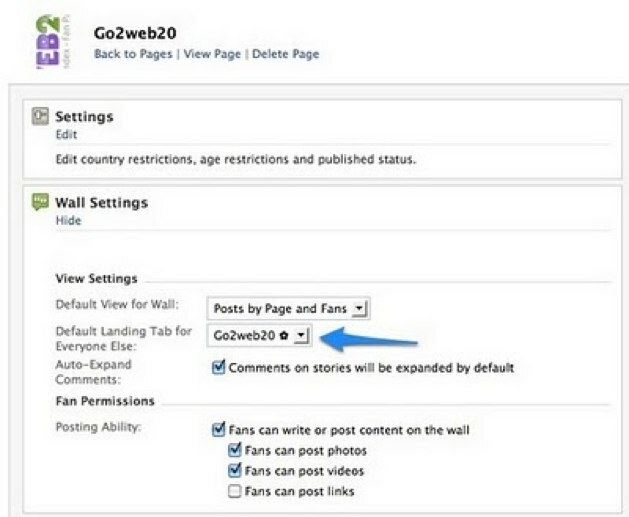 Go to your page and click on ‘Edit Page’ > ‘Wall Settings’ > then on ‘Default Landing Tab for Everyone Else’ chose the tab which you want to present first when new users enter your Facebook page. People who are already fans of your page, will see the ‘wall’ first when they enter the page. The whole point of this landing page is that you make a informational welcoming page for new visitors that is interesting enough to be an incentive to fan this page. In a sea of fan pages this is important in terms of standing out and being innovative. If you want you can also add even more FBML tabs, but keep in mind that overall, Facebook only allows you to display and offer up to six tabs maximum, including the first two that you can’t change. So make sure you chose your tabs wisely. Twitter Tab – This application lets you bundle your ‘Twitter Updates Tab’ into your own profile or Fan page. The process is pretty easy: just add the application and follow the instructions. 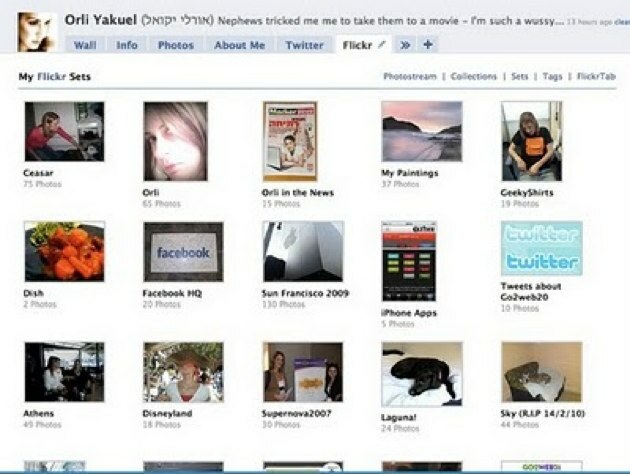 Flickr Tab – Same application but for Flickr photos. I found it more relevant to put this tab on my personal Facebook profile, but it is really depends on your brand’s goals and needs. 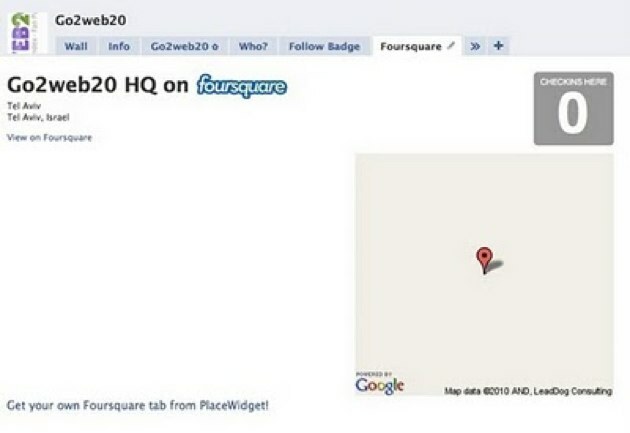 Add this PlaceWidget application and follow the simple instructions. And, that’s it. You now have a new tab on your page, Foursquare, and everyone can see how popular your spot is and read the tips visitors have left, furthering user engagement in a new way and offering visitors a chance to appear on your Facebook page and add their own tips. If you go through all the trouble of creating your own brand page, make sure you spotlight your team’s players and say something about the people behind the curtain. It adds a personal touch to your page and builds a connection between fans and the people involved in the project. 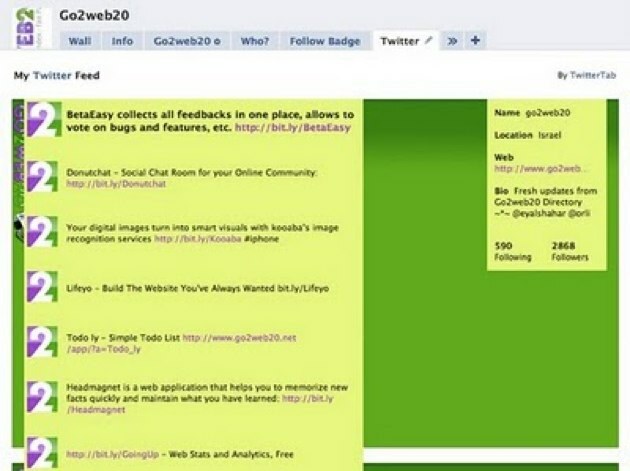 Again, with the help of the FBML tab, I’ve created a tab that tells more about my team at Go2web20 (it is was pretty easy since we’re just two people). But even if you have lots of people on your team, it is important to give some background about company management and staff accomplishments or to at least name one contact person that can be reached easily. I have to admit that I’m not as active on my own Facebook fan page (insert shame here) as I should be. I blame both Facebook and myself. First, I take accountability for not checking the page as often as I should. But, I also blame Facebook for not providing the right tools to track comments and conversations on pages like the ones available for our own profiles. It is really up to you how often you check your fan page activity. But, don’t think you can now sit back and put your feet up. This is not one of those “build it and they will come” scenarios. Don’t take it for granted that you have a page available. No matter how great you’ve made it, if you aren’t active, it defeats the whole purpose of having one. A fan page requires maintenance. You have to be there for your page visitors. You have to talk with your fans. You have to answer questions, absorb feedback, and overall, make the conversation flow with consistent fresh content. I really think Facebook never predicted the volume of pages people would create and the effect of these pages on businesses/brands. 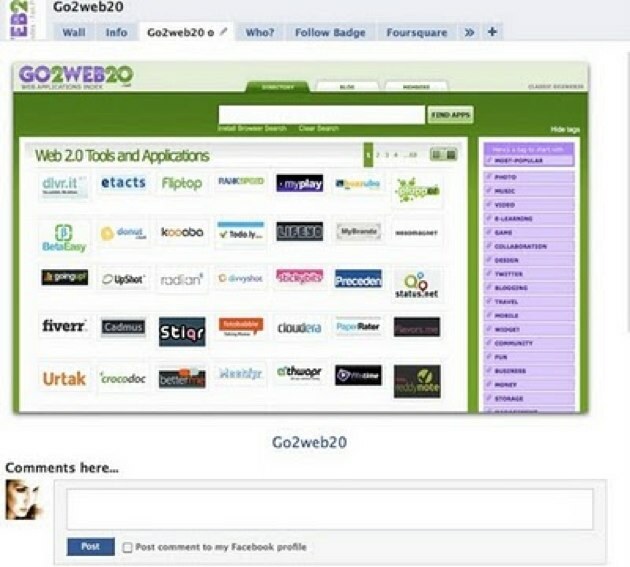 Obviously, Facebook isn’t currently providing the right type of support and tools for pages builders. Until Facebook reconciles these changes into their Facebook pages concept and tunes into the importance that pages have garnered over the last few months, we’ll end up with somewhat crappy looking pages that we’re creating with just about any and every tool we can muster up.